Diana Gabaldon | Great Scot! So, has everyone recovered yet from this week’s heartbreaking episode? I was greetin’ so hard there towards the end that it took 3 viewings and multiple people pointing it out to me on Twitter to recognize that there was even Gaelic in this week’s offering from the Outlander Writers’ Room. However, I’ve dried my tears, consulted the oracle and have the below translation to offer. Na bith còin, a bhalaich. Bithidh e glè cheart. – Don’t cry, my lad. It’ll be quite (i.e. all) right. I know I’m more than a wee bit late with this, but here’s the fevered ramblings of Duncan Kerr from “All Debts Paid”. 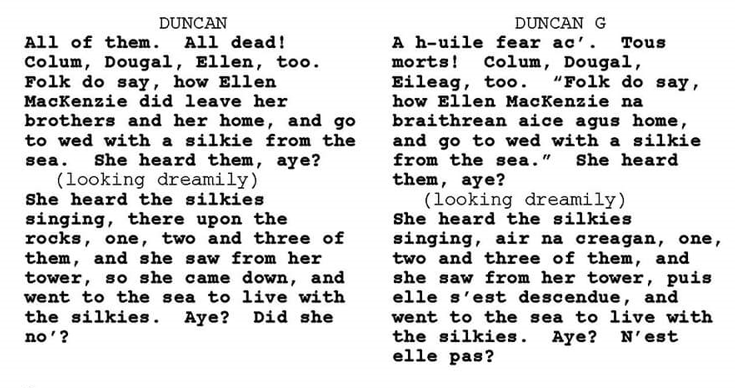 Because this scene is so garbled between English, Gaelic, and French, I’m going to just post the actual script, so you can see for yourselves, rather than trying to do line by line. Stay tuned for episode 304 – Of Lost Things shortly. Sorry for falling behind everyone, but the Gaelic has been few and far between at the French Court! 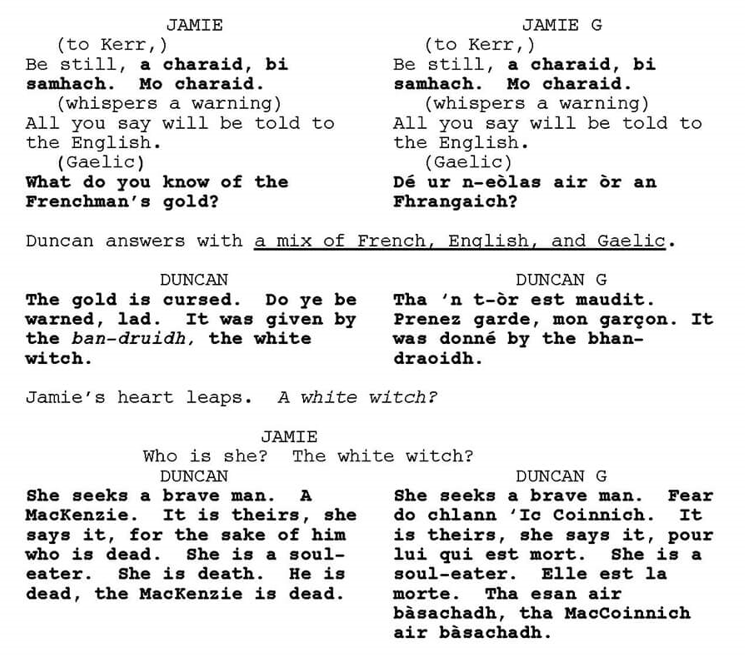 I promise I will go back and do a catchup post for all the little words here and there in episodes 202-204, but in the meantime here is the answer to everyone’s burning question from Episode 205 regarding the Gaelic oath that Jamie says during the argument with Claire in the final scene. I’ve also received questions the last few weeks regarding a word that Jamie uses frequently that sounds like ‘shaw’. In some cases, I translate it as seo/this or an seo/here. I made a comment on Twitter yesterday about Sam Heughan throwing that word in often. Sam responded and said he also uses Seadh or yes, as well. The two words can sound very similar (show vs shug) so you have to judge on context.